One of my family's favorite things to do during our free time is dining out (eating new dishes and trying out new restos). We are quite adventurous when it comes to food and I realized I haven't been sharing our food adventures in this blog anymore. Don't worry, I'll try my best to blog more often. I did hair and makeup for a prenup photoshoot a few weeks ago in Antipolo. After the successful photoshoot, my clients treated the whole team with a dinner at Max's Restaurant in Blue Wave Marikina. They ordered Max's fried chicken (of course! 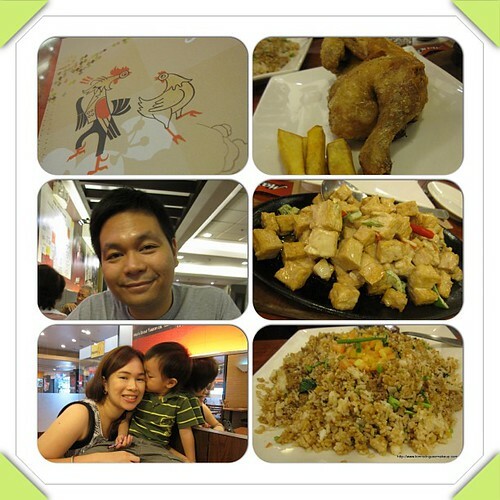 ), Tinapa Fried Rice, Sizzling tofu and Monggo guisado. After that I fell in love with Max's dishes once again. I really really enjoyed that dinner, it made the tired feeling go away. I liked most the Tinapa fried rice (oh so good!) I think they made it for the Lenten Season only. You guys have to try it before it's gone like McDonald's Twister Fries. And also the Monggo Guisado (I liked how they cooked it not too thick and it has a hint of chicharon flavor). And lastly the Sizzling Tofu...one of the best dishes of Max's. I can't forget the food that we ate that day so I asked my hubby to have dinner there a few days ago so he could taste the tinapa rice I've been raving about. He liked it too! But we didn't order the monggo because he doesn't eat foods high in uric acid.